Cumberland, Md. — McCoury Music and High Sierra Music have announced the addition of a bluegrass music academy to the program for DelFest 2009, broadening and enriching the festival experience for all levels of musicians. The first Delfest Academy will take place May 18-21, 2009 with DelFest 2009 following directly on May 22-24. 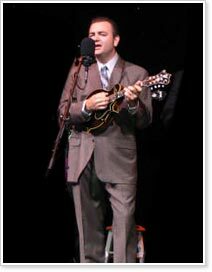 The 2009 DelFest Academy will consist of a friendly, encouraging, and intensive three-day learning experience with a group of some of the finest musicians in bluegrass: mandolinist Ronnie McCoury, banjo player Rob McCoury, fiddler Jason Carter, and bassist Alan Bartram, the Steep Canyon Rangers, and Ronnie Bowman. The Academy will offer two levels of instruction: Level 1 (novice to intermediate) and Level 2 (intermediate to advanced) for guitar, banjo, fiddle, mandolin, and bass. A Meet & Greet for students and instructors will kick off the academic week. A Q&A session with the Del McCoury Band and a wrap party on Thursday night will also take place. Each student may bring a guest to all extracurricular "after-class" functions for a nominal fee. In intimate classes led these world-class bluegrass professionals, students will receive instruction targeted to their individual needs, with plenty of opportunity for one-on-one interaction with their instructors. The overall direction of each class will ultimately be determined by the students' goals and needs. Students may expect to learn how to lead jams and receive tips on practicing, technique, and accompaniment, and benefit from direct interaction with instructors who can help them achieve their musical objectives. If there is enough interest, the Academy may also add some elective classes on singing and songwriting. A very limited number of spots are available for the 2009 DelFest Academy. Ample tent and RV camping is available onsite; there's plentiful lodging nearby. The area also offers many additional recreational options, including swimming, fishing, hiking, and biking. DelFest 2009, set to kick off on May 22 (the day after DelFest Academy ends), offers a fantastic lineup for its second event. A celebration of the musical heritage of Del McCoury, DelFest is a family-friendly event and takes place at the Allegany County Fairgrounds in Cumberland, Maryland.